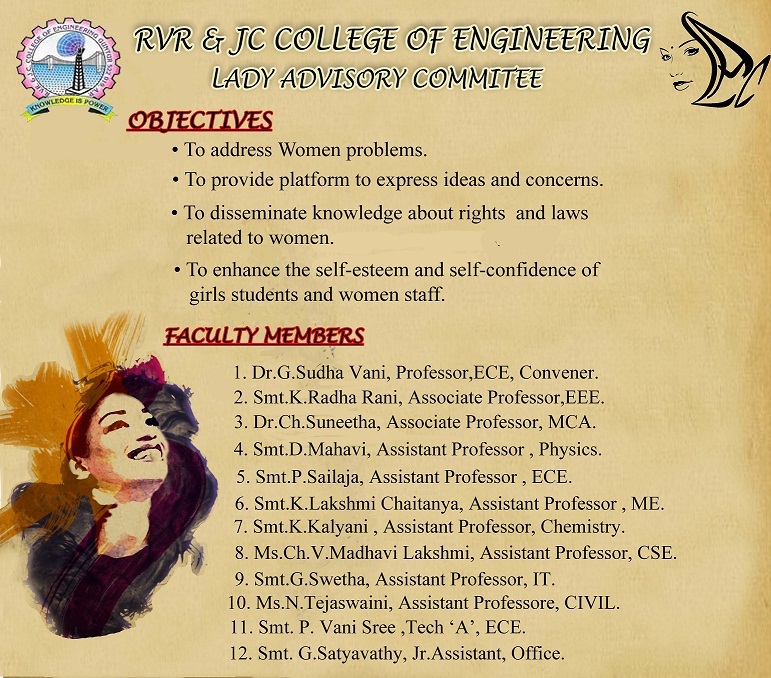 RVR&JC college of Engineering believes in treating its students like young adults. In general most students find life orderly and congenial in the campus. While the students, as adult citizens of the country enjoy their rights, they also are expected to be aware of their responsibilities. The institute will not support any act that is illegal as construed by the law of the land. As adults, the students are expected to have a fair sense of which act is legal and what is illegal. They should conduct themselves both inside and outside the Institute in a manner that is befitting an institute of this stature. In addition to being mature and responsible in conduct, the students are expected to respect the rights of the other members of the RVR&JC community. The Institute encourages an all round development of students' personality and their progressive and creative thinking. At the same time, in order that they effectively discharge civic responsibilities and virtues, the Institute sets its own terms of conduct that must be adhered to by the students. The Institute can take action, if these terms are violated, through different Committees. Parents generally tend to think that their ward's life is moulded once he/she enters the college. But this is still a learning phase and the parents encouragement and monitoring is indispensable. The parents should make sure to know how their ward is faring in the institute. In case the student isn't performing well, the parents should be able to understand where the shortcomings are and take steps to the best of their ability to rectify these. Parents have an important role to play in monitoring the performance of their children, especially during the first two years. Attending classes regularly is a fundamental requirement for acquiring technical skills.